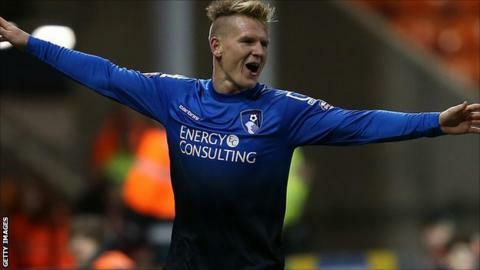 Matt Ritchie says Bournemouth have the mental strength to sustain a challenge for promotion to the Premier League. The Cherries are a point clear at the top of the Championship after defeating Blackpool 6-1 on Saturday, a game in which winger Ritchie scored twice. When asked if the the team can handle the pressure over the coming months, the 25-year-old told BBC Radio Solent: "I believe so, yes. "We are not going to get ahead of ourselves." The former Swindon player continued: "We are going to keep our feet on the floor, keep working hard and keep the same mentality we have shown so far. Hopefully we can keep winning games." The Cherries are next in action on Boxing Day against Fulham and Ritchie, who has scored six goals this season, says there is a desire in the squad for success. "We've got young lads, and hungry lads that have probably got their best years of their career ahead of them," he added. "We've all got the desire to play at the highest level, there is great hunger in the dressing room and a desire to get better and improve. "Come the end of May, we will see where we're at."